The Epistles of John are commonly overlooked and that’s unfortunate but understandable. The logic is often obtuse. The structure appears cyclical. 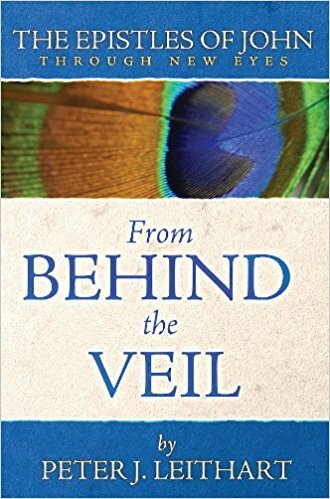 As I prepared to teach 1 John, I wanted a fresh take, and Peter Leithart’s Epistles of John: From Behind the Veil commentary did not disappoint. Many balk at discerning the setting behind 1-3 John, but Leithart casually runs past. According to Leithart, “John’s letters are part of the New Testament’s final response to Judaism” (p8). He dates the letters as pre-70AD, and thus the “last hour” (1 Jn 2:18) as the soon-coming end of the Old Covenant through the temple’s destruction. The antichrists, commonly understood as (proto-)Gnostics, are “Jews or Judaizing Christians” (p13). But what of Gnosticism? Leithart argues compellingly, from recent scholarship and ancient Christian writings, that Gnosticism in fact was “a Judaism that has become Christian, only to revert back to Judaism” (p21). This proposed setting results in some fascinating re-thinking. For example, “light”, usually understood morally, is rather “temporal and eschatological” (p23) since creation is intended to move from darkness to light. So the darkness “is not bad, merely early” (p23). For Leithart, darkness is a symbol of the Old Covenant that is passing away in John’s time (1 Jn 2:8-11). The Old Covenant was not bad, but it is wrong to cling to the darkness once the Light has come. However, this re-thinking doesn’t always appear to work, nor is it consistently applied. Given the larger context of sin (1 Jn 1:6-10), 1 Jn 1:5 appears to at least include a moral element, not simply temporal: “God is the God of the future” (p50). Also, Leithart does not explain how his understanding of light and darkness applies in 1 Jn 2:8-11, where his understanding of light would appear to require that the Old Covenant was not characterized by love. 1 John 2:2. Leithart defends propitiation; that the Son “endured the jealous wrath against those who committed the offense” (p58). However, in the LXX, the word John uses here is never abstracted in such a way, but is specifically connected to the cover on the Ark of the covenant. 1 John 2:18-27. This “last hour” refers to events surrounding the fall of Jerusalem in 70 AD. For, “either John was wrong or he was referring to the end of something other than the space-time universe” (p94) Specifically, the “antichrists” are false believers from Jerusalem, who, though they “confessed Jesus in some sense” (p98-99), effectively denied Him through their Judaizing of Gentile converts. 1 John 5:6-9. In the notorious water and blood passage, Leithart defends that Jesus “came” by water and blood refers to His baptism and death. Jewish unbelievers expected a messianic baptism, but not a messianic death. The water and blood continue to testify of Christ through the sacraments of baptism and communion. The intent of this series is “thoughtful Christians without being overly academic” (back cover). One of the greatest strengths in this volume is Leithart’s ability to creatively but faithfully move from text to application. Many commentaries are unable to do both well, where “applications” are either uninspired or untethered from the text. Any reader of Leithart knows that he loves literary structure and chiasm. In fact, the entire book is seen as a chasm. Some outlines seem forced, others illuminating. Either way, this is a welcome feature of the commentary that sets it apart from others. That said, this wouldn’t be vintage Leithart without some idiosyncrasies. Connecting the seven part chiastic structure to the seven days of creation. Aligning the individuals in 1 Jn 2:12-14 with prophet, priest and king. It’s unclear why the unique interpretation of 1 Jn 2:2 is a solution to universalism. The three pages of sarcasm directed towards antichrist-hunting is frustrating and unnecessary. Twelve instances of “faith” words in 1 Jn 5:6-21 connects with the twelve tribes. These oddities are the trade-off for the truly profound insights found only here. Leithart is ever-provocative and thoughtful, even (often especially!) where one does not ultimately agree. His excellent writing is ever on form here, he draws fascinating OT and theological connections, and his application is fantastic and natural. Though this commentary is relatively short and has a personal writing style, it should not be dismissed by pastors or students. Nor should non-preterists overlook it. Yes, Leithart is idiosyncratic at times, but of all the commentaries I used while teaching 1 John, I most looked forward to cracking open this one. I highly recommend it. Many thanks to Athanasius Press for providing a review copy!